Most teacher candidates have little experience with learning other languages. They therefore become cogs in the assimilationist machine that causes immigrants to lose native languages and become monolingual in English (Rumbaut, Massey, & Bean, 2006). In a time of devaluing immigrants (and their languages) and failure on the part of most Americans to learn other languages, educators need to focus on the role of other languages in promoting multicultural understanding and to increase language learning in the US. This chapter examines bilingual teacher candidates' experiences with language learning. For four years, students studying for ESL/bilingual licensure were asked to rate their language abilities, finding that 30% rated themselves as bilingual, with 70.43% of bilinguals describing themselves as heritage speakers. 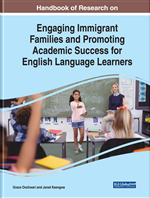 The authors report the overall findings as well as the bilingual heritage speaker candidates' own words on their experiences with language learning and maintaining their bilingualism. What do you call a person who speaks many languages? What do you call a person who only speaks one language? Unfortunately, this joke is all too true when interacting with Americans. In fact, two of the authors of this chapter have been teaching candidates for English as a Second Language (ESL) or bilingual licensure at the university level and have witnessed first-hand how lingua-phobic we Americans actually are, observing large numbers of students who have minimal knowledge of languages other than English. While conducting a larger study focused on examining the experiences and attitudes of pre-teacher candidates for ESL/bilingual licensure toward language learning, the researchers noticed a group of students who had succeeded in overcoming several blockages in order to maintain ability in their heritage language at a high enough level in order to qualify as bilingual teachers. The purpose of the present study is to examine the roadblocks that these heritage speakers encountered and how they overcame them to become bilingual teachers or candidates. To accomplish this, data from a larger, more general study will shed light on the number of teacher candidates who surmounted obstacles to achieve or maintain bilingualism among all students seeking ESL/bilingual licensure. In addition, the present study will share testimonials written by the bilingual heritage speakers to clarify the common patterns among them as they struggled to preserve bilingual abilities. Finally, the study will draw implications for teaching and how to improve education to remove some of the obstructions that prevent heritage speakers from sustaining their bilingual ability. English Learner (EL): An education category commonly used to describe students who arrive at school in the US without knowledge of English, thereby putting the focus on their need to learn English (but a significant improvement over the former label Limited English Proficient [LEP]). Frequently appears in the redundant formulation of English Language Learner (ELL). Bilingual Education: The continued development of the student’s native language within school, while learning English. Bilingual education is most commonly transitional, meaning that it only uses the native language for a limited time with the goal of transferring to all-English instruction (usually three years). However, other forms such as longer termed maintenance programs do exist, as well as programs like dual language immersion. Heritage Language: The language that children inherit from their parents (when it is different than the societal language). Native Language: The language(s) learned through natural exposure as a child. Commonly referred to as the first language, a label that prioritizes it over any other languages learned and fails to capture the reality of simultaneous bilinguals. Subtractive vs. Additive Language Policies: Subtractive language policies give no or limited support to the native language and seek to replace it with the language of school, while additive language policies support the development of the native language at the same time that an additional language is being learned. Monolingualism: The use of only one language (or dialect) to communicate in everyday life. Simultaneous vs. Successive Language Learning: Simultaneous language learning occurs when exposure to multiple languages occurs at the same time from birth. Successive takes when learning an additional language after learning much of a native language. Emergent Bilingual (EB): A more additive way of viewing students who come to school without knowing English, looking at their knowledge of another language as a positive scaffold to which English can be added while the native language continues developing so that the student realizes full bilingualism. English as a Second Language (ESL): The teaching of English to speakers of other languages when they are enrolled in English-speaking schools. ESL instruction can occur in many formats, including within bilingual education. Basic Interpersonal Communicative Skills (BICS) vs. Cognitive Academic Language Proficiency (CALP): Terms first developed by Jim Cummins to describe the difference between the discourses of social and academic language. Bilingualism: The use of two (or more) languages (or dialects) to communicate in everyday life. The different language modalities of listening, speaking, reading, and writing all need development in more than one language to achieve fuller bilingualism.